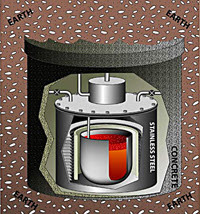 The portable nuclear reactor is the size of a hot tub. It’s shaped like a sake cup, filled with a uranium hydride core and surrounded by a hydrogen atmosphere. Encase it in concrete, truck it to a site, bury it underground, hook it up to a steam turbine and, voila, one would generate enough electricity to power a 25,000-home community for at least five years. The company Hyperion Power Generation was formed last month to develop the nuclear fission reactor at Los Alamos National Laboratory and take it into the private sector. If all goes according to plan, Hyperion could have a factory in New Mexico by late 2012, and begin producing 4,000 of these reactors. Though it would produce 27 megawatts worth of thermal energy, Hyperion doesn’t like to think of its product as a “reactor.” It’s self-contained, involves no moving parts and, therefore, doesn’t require a human operator. This entry was posted in alternative energy and tagged future on November 26, 2007 by Jay.